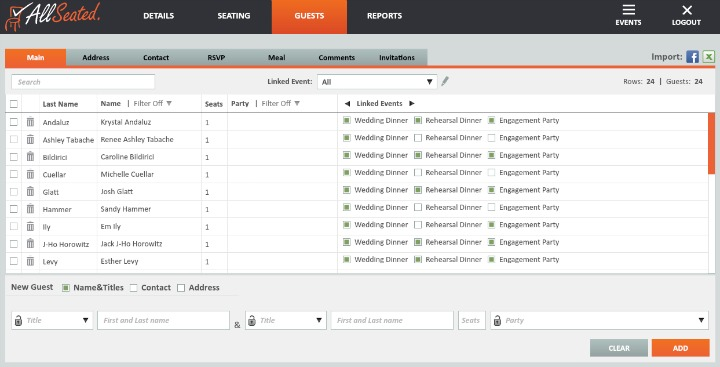 AllSeated provides event planning software useful for every type of event. Why use AllSeated for your next event? Access to a state-of-the-art guest list. Build and manage your event guest list in your AllSeated account. Enter guest names and mailing addresses which can be stored alphabetically or filtered into categories for even easier organization. Within your guest list you also have the ability to keep notes, enter meal type information and track RSVP’s directly in your account. The seating tab will give you access to your floorplan. This is where the floorplan for your event will be available to you once it is uploaded into the AllSeated platform. Most venues already have floorplans uploaded into the AllSeated platform. In the event that you cannot find your floorplan, you can provide us with a floorplan marked with at least one accurate dimension and our team will scale and upload it into the platform for you. The objects section provides you the opportunity to design your floorplan layout. Select objects from various categories in order to locate the tables and other objects that will be used at your event and then arrange them in your floorplan. 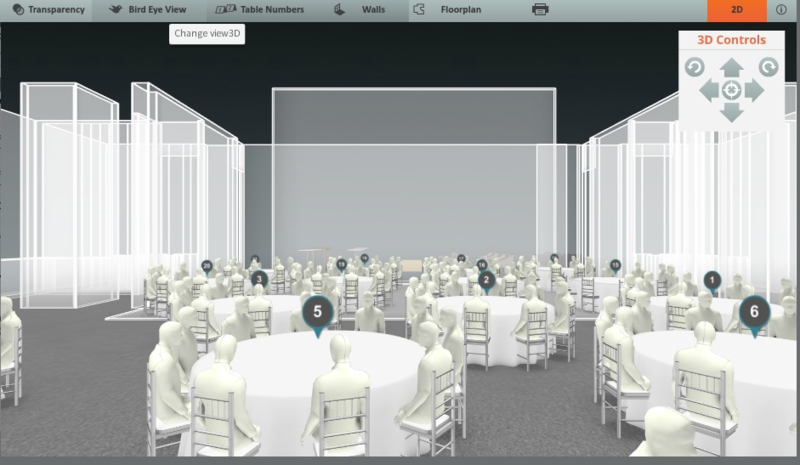 View the floorplan layout in 3D to create a virtual walk through of your event. The seating tab in your AllSeated account provides you with access to your floorplans, guest list, and layout. 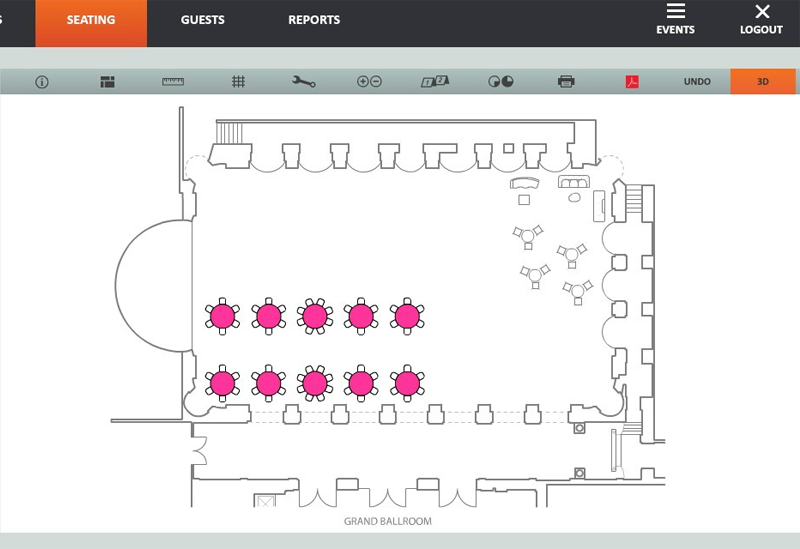 From there, you can easily seat your guests directly from your guest list at the tables you have positioned in your floorplan layout. AllSeated provides you the easiest and most effective way to collaborate with your vendors and entourage regarding the details of your event. Invite your close friends and/or family members into your account for help with things like entering guest information, opinions on your floorplan and assistance in arranging your seating chart. 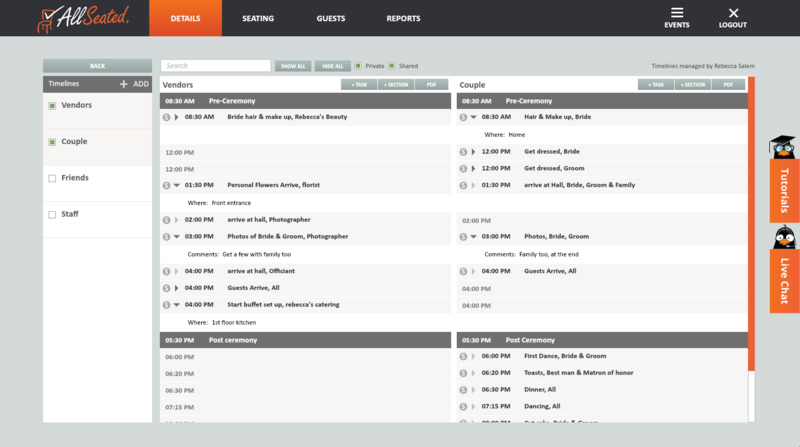 AllSeated’s event planning software offers you the ability to create multiple timelines for your event. In addition to creating a day of timeline for yourself to keep track of beauty appointments and your schedule of events leading up to the affair time, you can also create a timeline for your vendors. Collaborating with your vendors within a vendor timeline will keep everyone working from the same page regarding your event. 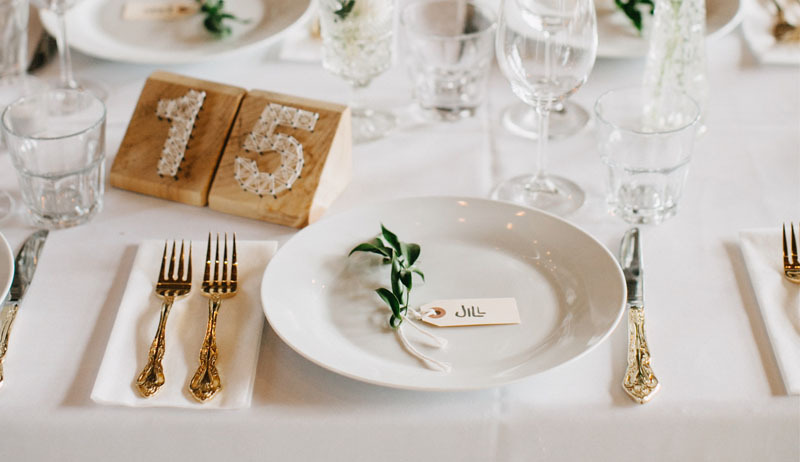 The collaborative aspect of AllSeated’s event planning software with everything updated in real-time helps to keep everyone current on all event details. Full Check-In System: Let your guests know where they’re sitting with the use of our mobile check-in system! Simply enter a guest’s name and their seating assignment pops up. Our check-in system helps you to keep track of who is in attendance, and who is unaccounted for while also giving you direct access to your master seating chart! Also featured in the day-of app is real-time collaboration and live check in updates, an overview of check-in status, and the ability to view your floorplan layouts in both 2D and 3D.